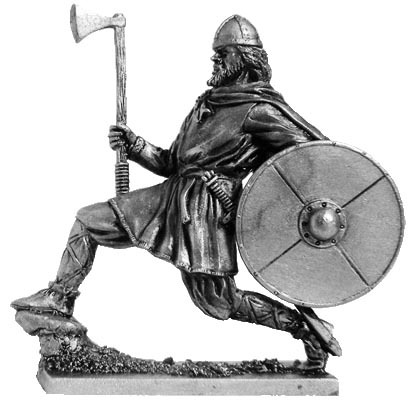 - warriors and pirates who lived on the territory of the Scandinavian peninsula in northern Europe since the end of VIII to XI century. Insearch of prey, they raided the coastal settlements throughout Europe, reaching Spain, Italy and Byzantium. Viking dressed in a simple woolen tunic with long sleeves and pants are spacious, tied below the knee, criss-cross fabric braid. Shoes made of soft leather. Cloak fastened with a pin with a special metal buckle. Head defends a simple helmet, riveted in four parts on the frame. Round shield made of wood and covered with skin. In the center is a hemispherical iron umbon, under which there is grip. Shields usually painted in red, yellow, black and white, at least - in green and blue. Surface of the shield is usually divided into two or four parts, painted in a contrasting color. Battle Axe has a wide blade and long handle with a leather-wrapped at the end. The sword was an expensive weapons, which the Vikings are very dear to them, gave him a resounding name and hereditary.